There are two forms of cholecystitis. These are acute cholecystitis and chronic cholecystitis. Generally cholecystitis commonly affecting woman age 40 and over. Acute cholecystitis commonly present as edematous thickened wall of the gallbladder with infiltration of the inflammatory and vascular congestion. The gallbladder appears large and discolored. There will be a purulent or cloudy bile in the lumen. The stone may obstructing the neck of the gallbladder. Acute cholecystitis usually caused by cytomegalovirus infection, cryptococcus infection postoperative, traumatic or burn states. Patient who suffers from acute cholecystitis may present with signs and symptoms such as right upper quadrant pain on palpation, fever, vomiting and nausea. There will be a positive Murphy’s sign such as arrest on inspiration on palpation of the right upper quadrant. Chronic cholecystitis pathologically present with Rokitansky - Aschoff sinuses which are an out pouching of the mucosal epithelium through the wall of the gallbladder. There is a mononuclear infiltration and fibrosis of the epithelium. 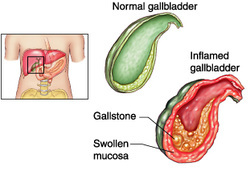 The wall of the gallbladder appears to be thickened due to extensive fibrosis. Chronic cholecystitis occur due to repeated attack of acute cholecystitis as well as the present of gallstones. Chronic cholecystitis may present with signs and symptoms such as intolerance to fatty food, colicky right upper quadrant pain which is recurrent in nature and nausea as well as vomiting. Cholecystitis is treated with antibiotics and cholecystectomy. 1.Trowbridge RL, Rutkowski NK, and Shojania KG. “DOes This Patient Have Acute Cholecystitis?” JAMA 289, no. 1 (January 1, 2003): 80–86. doi:10.1001/jama.289.1.80. 2.Nesland, Jahn M. “Chronic Cholecystitis.” Ultrastructural Pathology 28, no. 3 (January 2004): 121–121. doi:10.1080/01913120490489441.